Congressional hearings | Climate Etc. I will be testifying on Wed in the House Natural Resources Hearing on Climate change. That is, I will be testifying provided that I can make it out of Reno today — we are on the tail end of the massive snow storm in the Sierras. You may recall that last May, I was unable to make it to DC for another Hearing, owing to heavy rain in DC. Fingers crossed. There is also another Hearing on Wed, from the House Energy and Commerce Committees. The Hearing starts at 10 a.m. EST. I am assured that it will be on CSPAN and a podcast will be available (possibly not in real time). I will update with any further information, e.g. where the written testimonies will be posted, whether this will be streamed live. The only other scientist on the extensive witness list is my colleague from Georgia Tech, Kim Cobb. Also on the Witness list are governors from Massachusetts and North Carolina. This Hearing is not about the science per se, so it’s an opportunity for me to go in some different directions with my testimony. Well I’m excited to participate in this Hearing. I will post my testimony and verbal remarks at 9 a.m. on Wed, and hopefully point to links for live streaming and the written testimony from the other witnesses. Wish me luck navigating the airports. The Chair is Raul Grijalva, ring-leader of the notorious witch-hunt against Judith, Roger Pielke and others 4 years ago. Good luck, and may the Global Warming be merciful to you. The Chairman is an ecosocialist, as I am sure most all the Democratic members are. They do not believe capitalism and “defeating climate change and saving the earth” are compatible. I do hope that group did not invite you, as they will be expecting the hard line global warmist agenda. I am sure she is the Republican pick. Thank you, I see she was the voice of reason. Looks like you will be facing a difficult challenge of interacting with hostile adversaries whose minds are already made up. However, it is still a good opportunity to influence the viewing public, provided the news media are fair in coverage (is that even possible today?). And you never know, there might be a few participants who are on the edge that you can influence. I admire your perseverance. Good luck! From gambling in Reno, flying (gambling), to a big gamble in DC. Fare well. Good travels and safe return. If there is any way you could work in the findings of Harde, Salby, and Berry showing that human emissions are not responsible for the rise in atmospheric content it should be done. Nearly all of the todo is about controlling emissions and it is truly a fool’s errand if these scientists are correct. It’s a fool’s erand anyway. Don’t get me wrong, I agree with Salby and others that human emissions are not the main factor affecting the recent rise in atmospheric CO2. I also think that CO2 doesn’t affect temperatures much, if at all. The thing is, even if one accepts the AGW hypothesis, the suggested action to reduce the emissions is nonsense and ineffective. It’s so much ado about nothing, but it’s a huge waste of money, resources and time. It’s a load of crap. Bjorn Lomborg used the MAGICC model to evaluate the effects of CO2 emission reductions (doi:10.1111/1758-5899.12295). Net result to expect: almost nothing. Cost (according to the World Bank) 89,000 billions dollars. But it gets even worse. Even if all agree and promise, nothing will happen (except the waste of money and time). “And let’s be clear, that is very optimistic. Consider the Kyoto Protocol, signed in 1997, never ratified by the US, and eventually abandoned by Canada and Russia and Japan. After several renegotiations, the Kyoto Protocol had been weakened to the point that the hot air left from the collapse of the Soviet Union exceeded the entire promised reductions, leaving the treaty essentially toothless. The only reason Kyoto goals were almost achieved was the global 2008 recession. Moreover, emissions were shifted from one country to another. The EU, the most climate-engaged bloc, saw an increase in its emission imports from China alone equaling its entire domestic CO₂ reductions. In total, 40% of all emissions were likely shifted away from the areas that made promises. Negotiators in Paris are trying to tackle global warming in the same way that has failed for 30 years: by making promises that are individually expensive, will have little impact even in a hundred years and that many governments will try to shirk from. Judith Don’t be so wishwashy on pronouncements. At this point WE JUST ARE UNCERTAIN OR DON’T KNOW will not cut it. The alarmists always use those words to interject the precautionary principle which is difficult to refute to audiences that have little math and statistical understanding. Go after the alarmists based on all their wrong predictions and maybe an analogy of a medical practitioner being so wrong all the time, would you trust that doctor with prescribing something for you? Or rather use it to your advantage. The proposed actions are associated with the Green New Deal. Apply the Precautionary Principle to that! Victim of extreme weather events again! Safe travels. 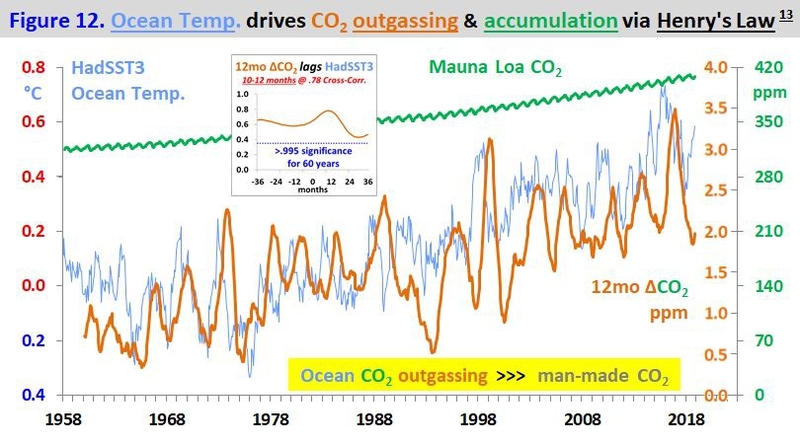 1) Human emissions are negligible compared to natural CO2 ocean outgassing, which always lags SST changes. 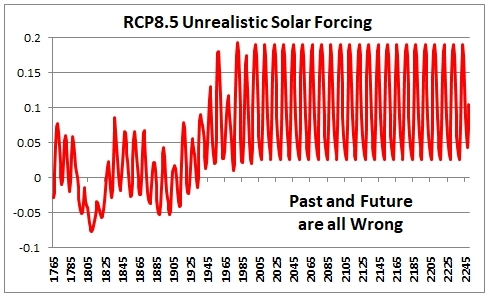 2) Solar forcing is completely misunderstood; RCP8.5 has phony forcing. 3) The harsh 2018/19 winter resulted from low solar minimum TSI, as happened during the last several solar minimums and historically. 4) The committee should be forced to define climate change in quantifiable terms that don’t include CO2. What is it? How much? … forced to define climate change in quantifiable terms that don’t include CO2. Sounds reasonable and it’s already been done but unfortunately, it has become as meaningless arguing whether security requires a wall, a fence, gates, guards, mathematical models… the definition of, ‘Climate Change,’ is 30 years of weather. By definition, it’s something we can only know after it’s already happened. There have been many attempts to use mathematical models to reliably and repeatedly predict the weather more than a few weeks in advance but that approach has failed. We don’t understand all of the factors and to claim otherwise is politics, not science. The big one may be coming now, heading our way now– it’s happened before and will happen again but whatever the calamity, one thing is different. This time around, the official government scientists of global warming will claim humanity’s CO2 caused it. That’s a problem but, the bigger problem is that we no longer believe what scientists say. We’ve learned that our government has been paying Western academia to create unverifiable global warming alarmist models that are worse than any looming natural disaster because without a belief in truth, we have nothing. To know we have been fed lies does not mean we do not believe in truth. It means we do not believe truth came from climate scientists. When anything becomes consensus, it is difficult to defeat it. Truth does not always win, in anyone’s lifetime, and sometimes the winners destroy the history of any truth forever. There is no one who is well known that actually studies natural climate cycles and the natural causes. There are many who study every kind of immediate correlation of climate changes with every thing that happens. No one is studying increased or decreased snowfall over a period of hundreds or thousands of years and what that does to sequestered ice on land, hundreds or thousands of years later. Correlations that are not immediate are not considered. Climate cycles are long term cycles, what happens during a phase causes changes that shows up in later phases, like most every other thing in life. Extensive list on climate change and only two scientists on the witness list? How odd, he says sarcastically. They have listened to scientists, and have determined they need to look elsewere, that may not be better. Anyway, this hearing is not about science, it is about what dumb thing we are going to do next and how much can they pull off before the whole alarmist schemes totally fall apart. Their friends are selling wind and solar power, how rich can they get before too many understand how useless and expensive and harmful it is. You will do your usual excellent job. Good luck on the travel. It seems unlikely to me that you believe that some action isn’t prudent. You have said as much in the past. A multi-gas and aerosol strategy – carbon dioxide. CFC’s, nitrous oxides, methane, black carbon and sulfate. Ongoing decreases in carbon intensity and increases in efficiency and productivity. And technical innovation across sectors – energy, transport, industry, residential and agriculture and forestry. Good luck with the storm and have fun. At least DC is not a travel problem. It is a balmy and dry 60 or so here now (to balance out last week’s zero –> natural variability). But as your Politico link makes clear, the coming Markey & Ocasio-Cortez (MOC) resolution is not quite as strong as the GND proposal I assessed. Still wacky though. The Dems want to make climate change a 2020 election issue, which is a pretty long push from now. They know that nothing big will get through the Republican Senate (or the President’s pen) but they are going to make as much noise as possible. Lots of space for skeptics to play in. On the other hand, the Green New Deal is so radical that a lot of Dems are afraid of it. It will be very interesting to see what the MOC says. The federal jobs guarantee is the wild card in this game. AOC has suggested a way to fight global warming is to use safety razors and eat bananas and peanut butter for breakfast. Works for me. Bill Gates is frustrated. He thought climate activists actually wanted to reduce emissions and have put some thought into it. They don’t, they haven’t. Hard lessons to learn. He thought it was a serious issue but he can’t find anyone who takes it seriously. Wow, I thought he was a green alarmist who had drunk the renewable cool-aid. He is a globalist. Whatever keeps him rich will be supported. His private investments may also not match his public words. Best of luck, Judith. Please remind them that the natural experiment was performed in 1929-1931, when human global CO2 production declined 30% and atmospheric CO2 stabilized. Temperature kept rising to 1941. And then it declined during the WWII years, when a fair amount of CO2 was produced. Declined enough to produce alarms about the oncoming Ice Age – they can check the covers of Newsweek and Time and Science News in the early 70s. And then, there has never been a temperature reversal in the last 500 million years preceded by a CO2 change. Nor, more recently, did CO2 change precede the emergence from the Last Glacial Maximum, the temperature plunge into the Younger Dryas, the rapid rise to the Holocene Optimum (with its 280 ppm CO2) and the gradual decline since then, punctuated by Minoan, Roman, Medieval and current Warmings, not to ignore the Little Ice Age. CO2 warms us and cools us and feed us. Leave it alone. That’s a very good comment on 20th century history, but about there never having “been a temperature reversal in the last 500 million years preceded by a CO2 change” — there’s also never been such a quick rise in CO2 concentration. It’s not necessarily bad, but it shouldn’t just be dismissed. A sudden CO2 rise should not be dismissed, it has caused crop production around the world to be improved. It is good for sure. Life on earth is better for billions. It should not be dismissed, it should be encouraged, if you decide things on actual data, more CO2 has only caused changes for good that have actually been identified and measured. There are claims of bad effects of rapid CO2 increase, such as bleached corals. I think this is something that might be better solved locally. Perhaps there’s a way to lower pH locally. I also think it’s legitimate to argue that some problems can’t be, or aren’t worth solving. There was a professor in Australia who studied the corals who said the corals were doing fine, some were dying and others were thriving, as always in history. There are many white coral sand beaches because corals have always died and been replaced. He was fired because he did not preach the consensus alarmist story. Universities do not get grants for saying anything is really OK.
Oceans rise and fall in natural cycles, shallow water can cause too much sun go kill some corals. They recover when the oceans rise again. That is one factor. PH values in the oceans vary by large amounts. There is no one known PH value that is the right one and the PH values are actually not acid, they are all on the other side of the neutral value. Consensus is mostly about money. PCT, I think it’s about a bit more than money. It’s a combination of money, left wing politics and Malthusianism. It’s “we’ve got ours — now we’ve got to do something about the teeming unwashed masses”. Look at a globe or a picture of the Northern Hemisphere from space. The only cause of significant ice on Greenland can only be caused by warm gulf stream currents that flow into the Arctic Ocean and thaw it so there can be evaporation and snowfall on Greenland. Warm times are normal, natural and necessary to sustain ice on land in cold places in the northern cold places. It snows more in warmer times when the Polar Oceans are thawed and that causes more ice volume and then more ice extent and then colder times. It snows less in colder times when Polar Oceans are frozen and that causes ice depletion and ice retreat and warming. This is documented in ice core data and history. These simple facts are what needs to be told to congress. Imo, your goal should be to influence US policy makers from believing the “Green New Deal” makes any sense. greeting from New Zealand…….safe journey Judith!! regards, Trevor Collins. Very good comments, all of you. The biggest challenge seems to be educating the Media. Keep it simple, it is not warm and dry when talking about climate, but cold and dry. How can the population trust and believe talking points by alarmists that are so inaccurate. We must call them on the obvious, life has repeatedly thrived when climate was warmer, give examples. ❶①❶① . . . The cloak of stupidity . . .
Alarmists have a secret weapon, to help them to avoid the truth. People who are interested in global warming, can be divided into 2 categories. Those who are open-minded, and willing to learn new things about global warming. And those who are close-minded, and unwilling to learn new things about global warming. Unfortunately, there are many people in the 2nd category. We call them “Alarmists”. Alarmists have a secret weapon, to help them to avoid the truth. It is called, “the cloak of stupidity”. This is like Harry Potter’s “cloak of invisibility”, but it is used to avoid “new” ideas. Like Harry Potter’s magic, the “cloak of stupidity” spell is invoked by saying some magic words, “denierus protectus”. Many Alarmists shorten this to just “denier”. I watched the entire hearing on C-Span. Given the Chair’s bias and some of the alarmists on the second panel, you did a fantastic job, Judith. Thank you for your courage. @canman. At the moment, at these levels, the rise of CO2 is insignificant compared to the other eight (known) influences on climate. Its GHG effect is at 50% with 20 ppm, and it declines exponentially after that, as recognized by Arrhenius. 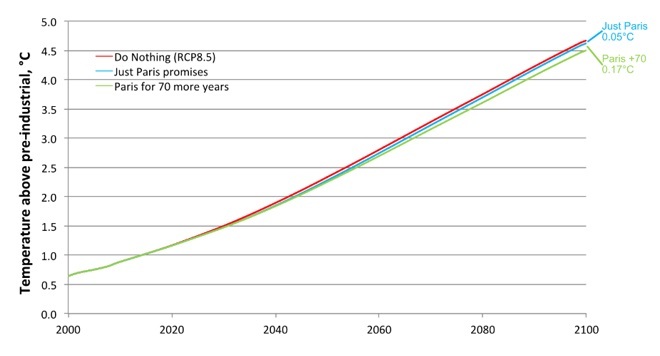 We are in the fifth half-life of that decline, and can expect, at a doubling to 800ppm, a 1.4% increase in GHG effect to be totally swamped in the other influences. Co2 is not in control of climate at this time, at these levels. We are not in control of CO2. It warms us and cools us and feed us. Leave it alone.